But before , someone from Tokyo visited us. Only a few months ago, and 24 hours of flight, more than 10,412 km later we received Takihiro, engineer and translator, CTO of AOS, the Japanese company that has recently licensed our technology. AOS is a company owned by SBI Incubation, INc. formerly owned by Softbank Internet Fund which has invested in mobile telecommunications companies. On that visit we mutually learnt about technology, processes and local cultures. 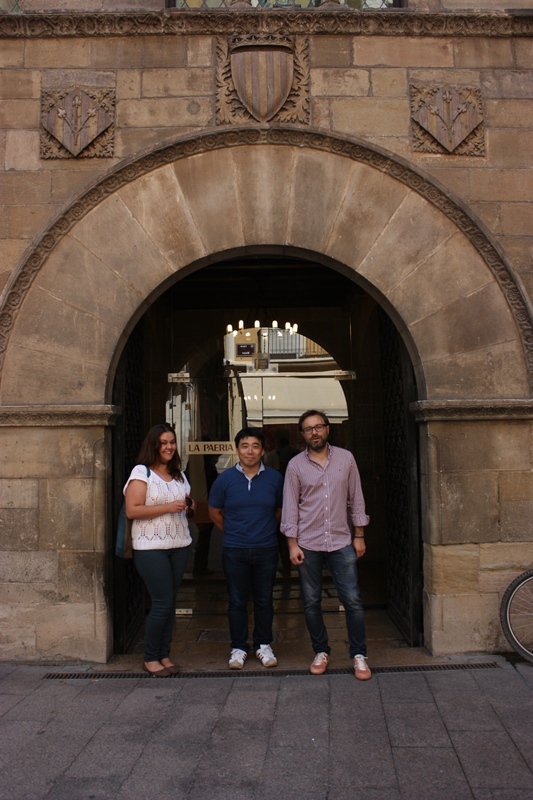 On a guided visit to great emblems of the city, namely LLeida City Council, La Paeria and La Seu Vella, Takahiro was surprised by the historical and architectural fusion and because both buildings were really intended for the defense. And to our surprise, we discovered that, sometimes steryoptypes are right. He recognized our joy, energy, willingness, hospitality, efficiency and dedication. We, in turn, have the opportunity to observe his dedication, commitment, effort, efficiency and devotion. Although Takahiro’s visit was not the first contact between the two companies, this took place among Sisco and AOS´ executive managers some months ago; it was the starting point for the collaborative work. Takihiro translated into Japanese both our user platform and Tools .He picked up all the necessary documentation to start implementing our technology. As of 1 November, we will have our own infrastructure to operate together with AOS in the Asian country. So now, our technicians are about to land in Tokyo and start to set up the servers. AOS is specialized in legal and computer forensics, two potential markets with a lot of common ground with Lleida.net. “This is a key step for us to be present in the telecommunications East Asian market”. Sisco stated. Under this agreement, Lleida.net will give legal validity to all digital or electronic information delivery for those companies asking for AOS/Lleida.net services in Japan. It also gives a new value for the rest of international customers having business in Japan. Mr. Takamasa Sasaki and Mr. Sisco Sapena shaking hands. AOS Technologies was established in Japan in 1995 and has grown with the IT Revolution. Their flagship data recovery product, FINALDATA, has been the No.1 market share since 2000.In 2001,AOS started to provide Japanese police with specially designed data recovery software designed for their needs. For more than 10 years since then, they have been cooperating with them in their criminal investigations to facilitate their gathering of evidence. AOS is headquartered in Japan and has established branch offices in New York (USA) and Geneva (Switzerland).